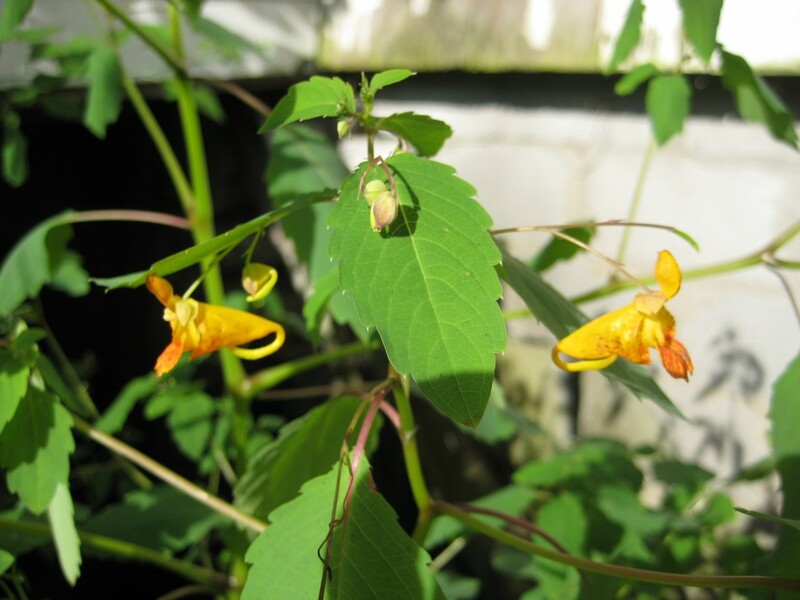 Home » birds » Jewelweed: Poison Ivy Cure? This is the plant that comes closest to being jewelry. The orange-gold blossoms dangle underneath the leaves like drop earrings. Hummingbirds love these exquisite flowers. In order to attract hummingbirds, a plant has to have tube-shaped flowers from which the birds can sip the nectar. Jewelweed is a native plant, and I’ve been trying to lure it into my garden, in the hopes that it will help me to lure more hummingbirds. But here’s the really remarkable thing about jewelweed. It cures poison ivy. At least some people swear it does. 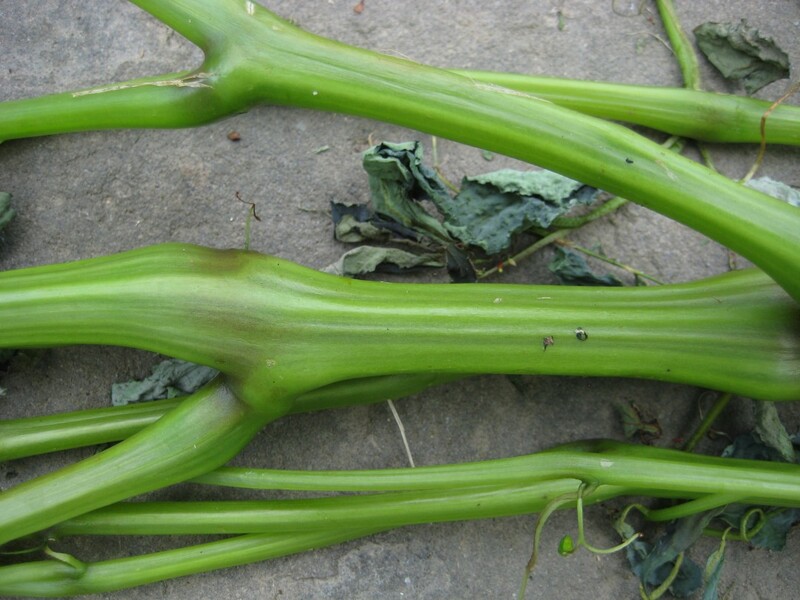 The thick stems of jewelweed are soft and juicy. Just grab a handful of jewelweed and rub it wherever you have poison ivy, and the rash will go away. In fact, just spreading the sap on your skin will prevent poison ivy from ever bothering you. Guaranteed. Absolutely. Oh, dear. Jewelweed is one of the many plants that, when you google it, turns out to be Dr. Jekyll and Mr. Hyde. Some people love it. Others sneer at it. Some swear by its magical medicinal powers and even charge a hefty fee for jewelweed products. Others scoff. Many sites claim jewelweed has no medicinal benefits at all. 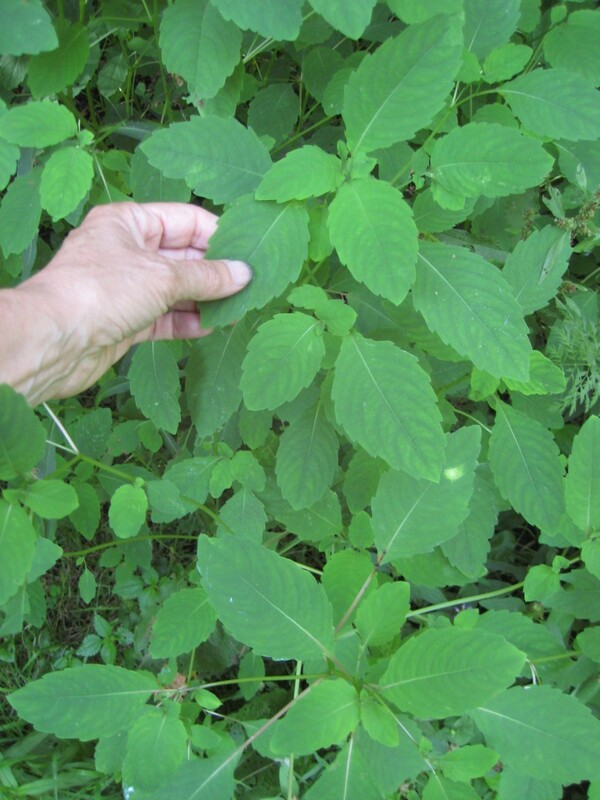 Several websites claim that Native Americans used it as a cure for the poison ivy rash. And I’m always skeptical when any one says “oh, the Indians did this or that.” There’s far too much phony “Indian” lore floating around out there. But a little research revealed many well-documented references to jewelweed as a poison ivy remedy. (For example an article written in 1933, on the Ethnobotany of the Forest Potawatomi Indians, by Huron H. Smith in the Bulletin of the Public Museum of the City of Milwaukee 7:1-230, p. 42.) So I’m sold. I think it’s fair to say that jewelweed has been used as a poison ivy remedy by Native Americans, and copied by European settlers, for many years. So if you’re feeling adventurous and want to try it for yourself, how to use jewelweed? The easiest way is to grab a handful and rub it on. It’s that simple. 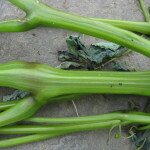 The stems have a clear sap that’s very like water and feels refreshing and soothing on the skin. You also can gather the plant and make an infusion, which is as simple as making tea with a teabag. Collect a few handfuls of jewelweed stems, put them in a bowl, and pour boiling water over them. Let steep for an hour or so, till the liquid is light brown. 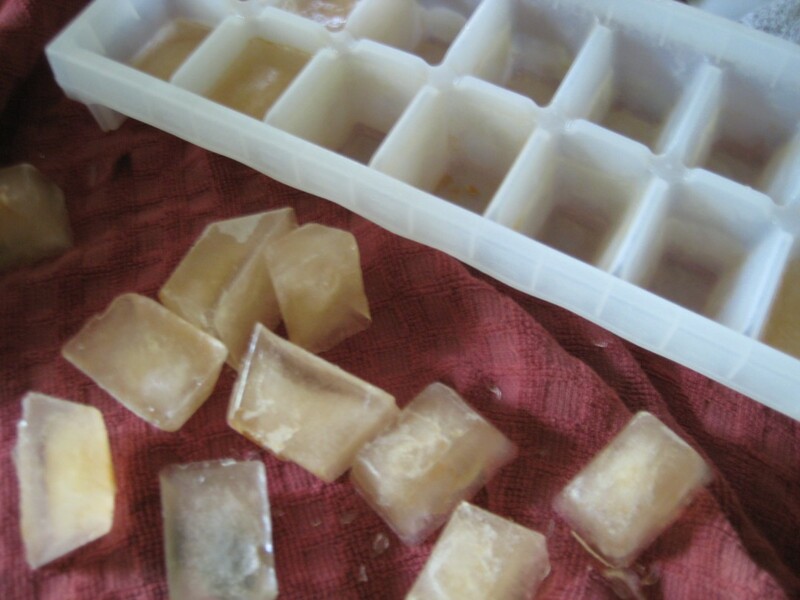 One ingenious herbalist recommended making jewelweed ice cubes, a cool way to apply the soothing medicine. Don’t put them in your drink! Just keep some handy to rub on your skin. Of course it’s so hot these days that any sort of ice cube is going to feel good on the back of your neck. 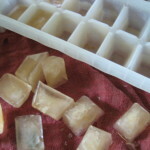 I haven’t had poison ivy recently, so I’ve lacked the opportunity for experimentation, but I can attest that the jewelweed ice cubes are very soothing on itchy bug bites. Thank you for this helpful info. I’m trying Jewelweed for the first time tonight. My poison ivy moved from my arms to my stomach. I’m sorry to hear that! Best of luck. OMG! So much incredible information packed into one article. I didn’t know that poison ivy was basically an allergy. Haven’t had it in a long time – haven’t been in the woods? Live in Colorado? I’m not allergic? I don’t know. Maybe you’ve outgrown the allergy, that can happen. Just be glad you’re not allergic to cats!